CTFishTalk.com: What line to use? 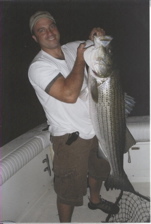 - Connecticut Offshore Fishing ( CT Offshore Fishing ) - A Community Built for Connecticut Fisherman. Viewing Topic: What line to use? Posted: Fri Mar 06, 2009 9:52 am Post subject: What line to use? I just started getting into fishing for stripers and blues last year, don't know what took so long. 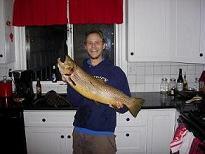 I was using 30lb floro-carbon line and had several fish break off, infact never landed anything larger than a 10lb. blue. I was thinking about switching up up 50lb. braid this year is this a good choice? I use 30lb power pro for blues and stripers. I don't like power pro for fresh water but it is fine for salt and it is cheaper than some of the higher end braids. I use 9" steal leaders for blues as they can bite through line pretty easy. Personally, I wouldn't use floro for blues or stripers as they will bite just about anything. Sorry honey, looks like we will be late again due to motor problems. yeah the floro was no good last year. The other question I had was about weight, my boys were using 3oz. all year when casting off of jetties and such, but that is too heavy for the 7' med action ugly stick that i build a few years ago, are 1oz. enough.